To preserve the confidentiality of the program described in the following article, only last names are used. Bautista is an immigration attorney and Project Director for the Immigrant Families in Crisis (IFC) program, that carries out services enacted through the Violence Against Women Act. Congress enacted the Violence Against Women Act (VAWA) in 1994, as part of the Violent Crime Control and Law Enforcement Act. Bautista founded the program in 2001 under the auspices of a San Diego non-profit organization with a mission of community empowerment. Bautista is joined at IFC by two legal advocates and eight law interns from two local law schools. The staff make it a priority to create a confidential, secure environment for clients, safe from their abusive spouses. Normally, when an immigrant seeks U.S. residency status, s/he must be sponsored by a legal citizen, typically a spouse or parent. VAWA provides the right for a spouse or child to self-petition for immigrant classification if he or she has been battered by, or subjected to extreme cruelty committed by the sponsoring legal permanent resident spouse or parent. Bautista and her staff assist clients in preparing applications for U.S. status, work permits, and a green card of permanent resident status. 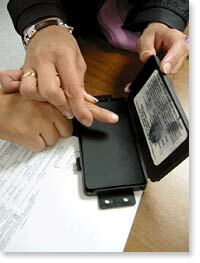 Client is fingerprinted for the residency application. Generally, the first point of contact with women seeking help is at one of the legal clinics held all around San Diego County. In spite of the lack of publicity for such clinics, women find out about the services by word-of-mouth, referrals from doctors, police, immigration, or domestic violence workers. At the legal clinics, the legal advocates and the law interns carry out qualifying intakes with potential clients. To qualify, women must either live with someone that has legal U.S. status, or if divorced, they must file within two years of the marriage. And they must provide evidence of abuse. Calderón states that in California, when a case is pending with the Immigration and Naturalization Services (INS), ... if a client has children and is not living with the abuser, she can get full scope Medi-Cal and Cal Works, maybe food stamps and Medi-Cal for her children. Medi-Cal provides public assistance for health care. When I first asked Bautista to describe IFCs services, she spoke a legal language I did not understand. One more try, weeks later, and I was still perplexed. Realizing that I wasnt understanding the legal terms, I asked, Can you talk me through a clients case? Bautista smiled thoughtfully and began, Okay, lets call her Maria. She remembered the case because it was one of her first, from years earlier. Since she didnt have the staff support then that she has now, she had to go through every step personally with the client. Client is photographed for the residency application. Bautista recalls, We had to include that in the story because that was part of the psychological terror that she was living under. Once we got through the entire story, the client of course, was exhausted and drained and so was I, just having taken in the story and being in that world for three or four hours. I then had to put that together in as clear a format as I possibly could, preserving her words. Bautista tried to impress upon her client, the need for her to gather documentation for her case. But she didnt have much to substantiate her story. Bautista states, She only called the police once, so we only had that one police report. She didnt really talk to anyone else. She didnt want letters from friends or family even though they were aware of what was going on. In spite of the difficulty in putting together the case, Bautista finished the lengthy application and filed it by certified mail with the Vermont Service Center. Since VAWA was a new law there werent many cases being filed. Within a month, Bautista received an approval. But, it wasnt the green card yet, she added. Hearing that her case had been accepted, Maria broke into tears. Because her story had been validated, explains Bautista. The next step was to apply for a work permit and green card. The entire process took months, due in part to Marias need to find money for the applications. Bautista continued to have contact with the client for the better part of a year, providing her with referrals and resources as needs arose. 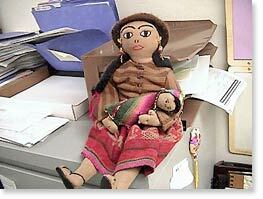 Upon separation from her husband, Maria had problems getting permanent custody of her children. She had to show the court that it would be in the best interests of her children to be with her. She also had to show that she would eventually have a work permit, and a way to earn money and support her children as a single parent. Bautista found the appropriate legal counsel regarding these issues from attorneys at the YWCA. Bautista went on to explain that the sole purpose of the interview with the local immigration office is to finalize the request for a permanent resident green card. The client must declare that she doesnt have a prior criminal background and is not a potential threat to the United States. Her appearance, with documents in order, prove too, that she is an actual person. Bautista describes her client that day as, ... excited, but she was nervous at the same time. We waited for the appointment for about an hour and a half. Its hard to assure a client that everything is fine if you see a sea of people all looking just as worried. Bautista said that people arrive at the immigration office for citizenship papers, green cards, and some arrive alone, just trying to find out how to begin their immigration process. The interview was held in a tiny office between an officer, Maria, and her attorney, Bautista. The law was still new, making Bautistas presence crucial. Bautista remembers the first question the officer asked, Wheres the husband? Wheres the petitioner? Bautista explained to the officer, Theres no need to have the husband here because Maria X is now her own, self-petitioner. Bautista noted that the officer seemed a little confused but she was prepared with the law. -- Have you been arrested, cited, charged, fined? -- Have you ever committed a crime of which you have not been arrested for? -- Have you ever engaged in prostitution? -- Have you elicited drugs? -- Have you participated in alien smuggling? -- Are you a terrorist? -- Have you been arrested? -- Have you used public benefits in the past? -- Are you relying on public benefits now? -- Have you ever been deported or had a problem with immigration in the past? Bautista said that clients who seek legal status through the Violence Against Women Act are exempt from questions regarding public benefits. They understand that they may need some extra support to get back on their feet. They try their best to work and pay their taxes so that they are not a burden on the United States but in situations like this, if youve just left the home and are staying in a shelter you dont really have much of a choice." Bautista counsels her clients to explain the details of any public assistance they have received and to describe any job searches, job training, career counseling and their plans towards a stable financial future. Bautista recalls her clients reaction, Even though I had explained to her over and over again what was going to happen it didnt really hit her until she saw the officer stamp the passport. She seemed to be frozen in the chair...I looked at the client and asked, Do you have any questions? Maria only wanted to know if it was okay to give the officer a hug. When they walked outside Maria told Bautista, This is all Ive worked for. This stamp can do everything. Maria received her official green card a couple of months later. Only then is the case officially closed. The process for Maria, took about a year and a half. Since her case ended, Maria has found work and is able to successfully support herself and her children. 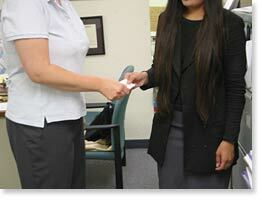 Client receives her green card. Interest in IFCs work has increased at the law schools. Eighty resumes were submitted during the last semester. Bautista and her staff divided them into three piles, We didnt read the resumes. We read the cover letters. If the cover letter struck us as someone who could relate, if that caught our attention, then that was in the definite yes pile. If we didnt get a feeling for the person or it sounded cold, or it was more a rehash of the accomplishments rather than why I want to do this kind of work and this is what I learned about you, then those would go in the definitely not pile. And if there was a little bit of sincerity there and a little bit of the other stuff that would go into the maybe pile." 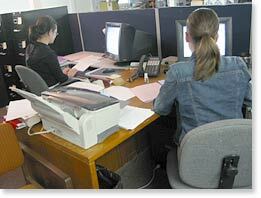 Law interns writing case files. Browne explains that there are approximately one-hundred agencies that make referrals to the IFC office. Thus, each agency can declare to their funders that they participate in the IFC project. Consequently, funders oftentimes believe that they are already funding the work. But its not going to direct client services for domestic violence victims. Office on Violence Against Women -- see their web site.